Kirkland, WA — Real Time Integration announced today its next generation of the NetAcquire™ Java Toolkit, with integrated JavaBeans support, for creating Java test and measurement applications and Java virtual instrumentation front-panels. JavaBeans are pre-engineered Java components that can be graphically configured without programming. The NetAcquire Java Toolkit and its companion Java Telemetry Toolkit include JavaBeans components for graphing, text and lamp displays, tables, disk logging, scaling, real-time network communication, and data distribution. These components allow the creation of real-time data display screens and instrument front-panels in only minutes. NetAcquire Java Toolkit applications perform real-world data acquisition and control by communicating with any member of the NetAcquire family of network data acquisition and control servers. 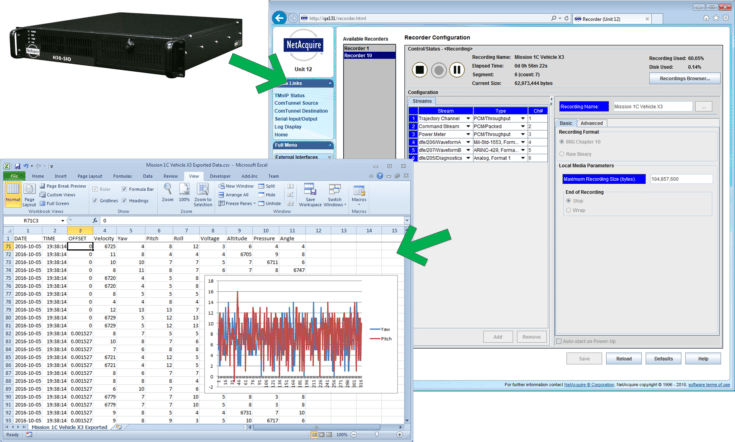 NetAcquire hardware makes analog, digital, and serial data available over any Ethernet network. This extends the cross-platform architecture of Java “write-once, run everywhere” systems by adding hardware input/output capabilities. Java is a hardware-independent environment, and the only way to interface Java to the real world is with network-based peripherals such as NetAcquire. The NetAcquire client/server network model also allows time-critical buffering and control code to run on the NetAcquire server hardware. Server-side data processing avoids forcing time-critical functions to run on the client computers Java interpreter. A completed NetAcquire Java Toolkit application runs on any computer or operating system that supports Java version 1.1; well over 50 environments to date. A NetAcquire Java Toolkit applet also runs in Netscape or Internet Explorer browsers for instant Web-ready real-time displays. The Java file for a completed applet can be uploaded to an integrated Web server inside each NetAcquire server, making the Java applet immediately available across the enterprise. The Java applet does not need to be installed on each client computer, and runs automatically from existing Web browsers. The NetAcquire Java Toolkit offers an open architecture environment, allowing Java programmers to write custom Java code to extend an applications capabilities. The NetAcquire Java Toolkit also interfaces to third-party JavaBeans class libraries, including those from KL Group and Ergotech. It is compatible with a variety of JavaBeans development environments, including Symantec VisualCafe. The NetAcquire Java Toolkit is an ideal component for building enterprise-wide distributed test and measurement systems, as well as Internet-compatible systems that allow remote data acquisition and control from anywhere in the world. Real Time Integration, located in Kirkland, WA, provides real-time distributed hardware and software, data acquisition, and communications solutions to companies worldwide. Application areas include industrial process control, laboratory monitoring, distributed test and measurement, and satellite communications.